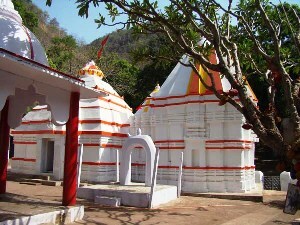 Sri Sri Harisankar Devasthana, in India, is on the slopes of the beautiful Gandhamardhan hills, Odisha. It is popular for its scenes of nature and presence of two Hindu lords, Vishnu and Shiva. As a holy place, along with a beautiful stream passing on the granite bed, it has given some visitors a feeling of peace. On the opposite of side of the Gandhamardhan hills is the temple of Nrusinghanath.The plateau between the two temples has been found to have ancient Buddhist ruins, which are considered to be remnants of the ancient Parimalgiri University.An ancient shrine situated in the Balangir District,Harisankar Temple is one of the ancient temples of Odisha.